I feel like shouting in Japanese like Hiro Nakamura from Heroes. Last night my Timeline, the behemoth of my thesis, was finished in terms of populating content and coding and testing on all three platforms… Firefox (which you code in, because it alone is standards compliant), Internet Explorer 7.0, and Safari. 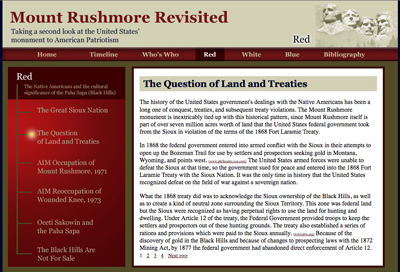 The significance of completing my Timeline is that this piece, although only one “section” of my website, included 30+ sub-section pages each with a unique design and historical content which had to be researched, written, and condensed. Today’s task, then, is to use the free afternoon (half day from work) and begin writing the short essays for the rest of the site. That and assemble the short list of portraits and biographical information for the “Who’s Who’ section of the site. 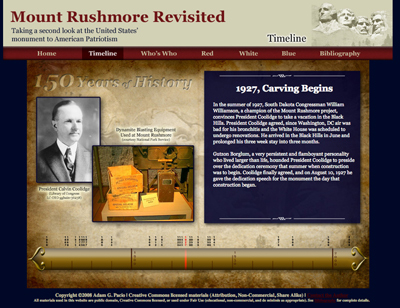 Tomorrow morning in the wee hours while trekking to Washington, DC for the Holiday, will be my time to generate the design for it… basing it off of the Timeline graphics frame design, but with tweaks… to keep it consistent visually throughout the site. 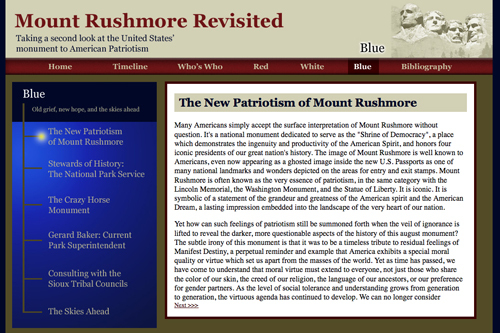 I am rather done with the subject of Mount Rushmore, thanks. 🙂 But I would have gotten to the point of disgust and distate over any subject after working with it so long and so in-depth. 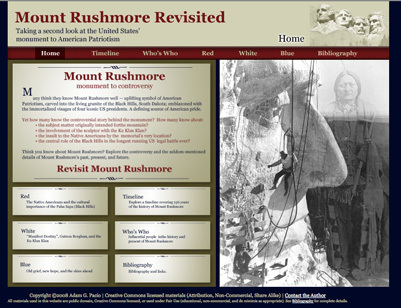 At the very least, my site will fill a niche in that there are websites out there which talk about the patriotic aspect of Rushmore, sites which talk about the historical aspects of Rushmore, and sites which talk about the controversy of Rushmore, but nothing that I’ve found which brings all three together into a single website. One and a half weeks and counting… AND on schedule! The timeline is now coded in HTML/CSS. ActionScript was just a bit too far out of my grasp, so I made an executive decision, and I’m glad that I made it. I spent all day yesterday working on nothing but populating the content for the timeline and tracking each of the photographic assets being used for the bibliography pages. Oy… the bibliography pages. Well, the good news is that I’m a third of the way done with the timeline in terms of years… I did 1858 through 1908, and a couple of years beyond that. The other good news is that between 1908 and 1958 is really the remaining 80% of the content… there’s only three nodes on the timeline left in the period from 1958 to 2008. So while I say I’m only a third of the way done, it’s more like halfway. Of course, getting it halfway done yesterday took longer than I thought… 14 hours of straight thesis work. It was actually lovely, because even though it’s logging lots of hours, I’m gaining a sense of completion as I go forward with it. Each year on the timeline integrates historical research and asset research, as well as good scholarship by taking meticulous care to attribute each source properly and in multiple locations on the page. This way, when it comes time to generate the bibliography for the images, all of my sources are already in MLA style and ready to be married on the page with thumbnail images. There’s always concerns about keeping details straight for proper attributions in the bibliography. My project complicates the matters even more because I am relying on historical photographs and resources, as well as modern photographic assets. I am pulling from many sources in the Creative Commons. This is an excellent exercise for me, because it has shown me just what a rich collection of source media exists in the commons space already. especially for academic/non-commercial purposes. Yet, when you do something like that, especially if you’re taking several different photographs or digital works and combining them into something new, you have to track each component artwork’s level of Creative Commons license. Although not all of them require Attribution, I give Attribution to all of the component artworks because it’s easier than trying to recall which one belongs where. Although not all of them require Non-Commercial, my enterprise is Non-Commercial, so it gets listed. And although not all of them require Share-Alike, all materials will be posted for Share Alike use. However, there are a couple of (thorny) assets which ALSO carry ‘no derivatives’, and I have to be careful not to alter those images or incorporate them into anything else at all. 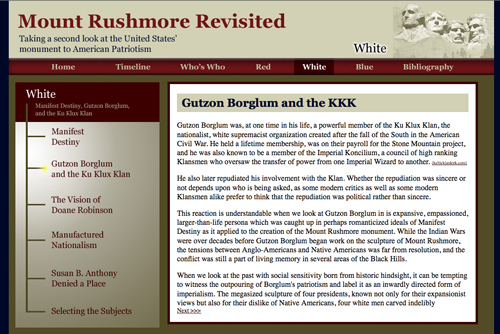 On -top- of that, I’m pulling resources from several public sources, like the Smithsonian, the National Archives, the Library of Congress, the National Parks Service, and the National Archaeological Association. And then there are a select few items which represent about 5-10% maximum of the site, which are simply sited from other sources under Fair Use (de minimis, educational, and non-commercial clauses). So while I certainly could have designed and written the entire Timeline yesterday, I would have been fairly lost when it came time to do the bibliography because of the vast range of sources. Thus, responsible scholarship is slowing down the content generation process significantly now, but with the added value that once a segment of the thesis is done… it’s done. The bibliography and notes is on Google Docs and saved to my hard drive for double backup. And Zotero saves time and research… without Zotero I would still be struggling. But hey… I’m getting there. Slowly and surely. Tonight I will be staying after work and hopefully finishing the timeline. Being realistic, I think I’ll put a good dent in the remainder tonight, and have to do the last bits of the content writing for the timeline on Tuesday. Wednesday is a half day from work, and I will use that afternoon to save out all of the individual HTML pages for the timeline to fully work, marrying code and content. Also on Wednesday evening I will take the timeline design panel and repurpose it for use with the Who’s Who portrait gallery. Much of that research is lifted out of the timeline, so it’s just giving users a choice of how they wish to interact with the site. Thursday is Thanksgiving and I’ll be heading down to Washington DC with friends, leaving at the obscene hour of 3am for arrival at breakfast time. I will be napping in the car, but I will also use that time to code the Who’s Who page. Since it picks up the structure from the Timeline page (albeit with far fewer rollover images) it should be simple enough to handle via laptop from the backseat of the car. Friday will be a day off for travel and recovery. 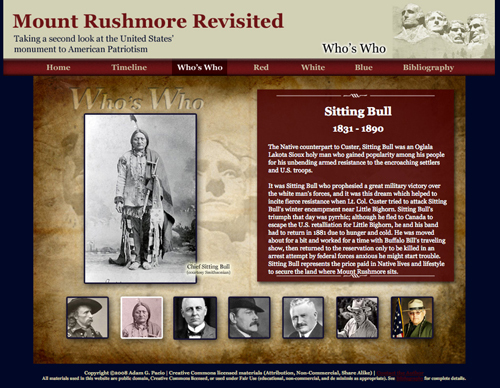 Then Saturday will be completely dedicated to populating the content of the Who’s Who page (biographies and portraits), followed by beginning to write the 24 mini-articles for the “Red”, “White”, and “Blue” sections of the website on through Sunday. This brings us to go-week, the Final Countdown, leaving only the Home Page to be written and designed, and the Bibliography page. Monday will be all about the Homepage. 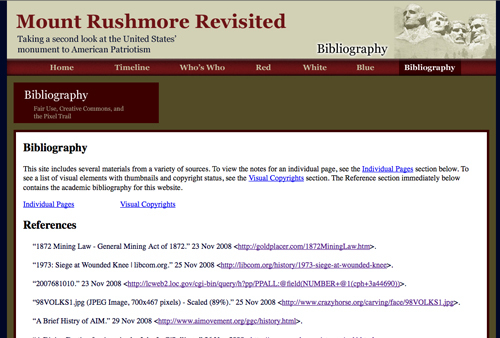 Tuesday and Wednesday will be all about the Bibliography page. Thursday sees final QA testing (making sure it all works on IE 7.0… already works on Firefox because we start coding with the standards compliant browser first and work outwards) and final proofreading check. Friday is when I write the paper describing the entire Capstone project experience, and Saturday it will be both uploaded as well as handed in on CD. And then Sunday… will that Sunday even exist? Quinnipiac has been home to a rash of intolerance and hate crimes recently. I extend sympathy and support to the victims of these terrible events, and I join with other QU students in hoping that they will rise above the ignorance of racist numbnuts and continue to make Quinnipiac their home and their University if at all possible given the hatred they’ve been exposed to. I’m more than a little concerned with President Lahey’s actions in response to this crisis once again. As reported in the online version of the “official” QU school newspaper, the Chronicle, the police have made arrests of suspects, and the university has already dismissed at least one of those students… even though formal guilt or innocence has yet to be determined in a court of law. [Lahey] also defended the decision to dismiss the alleged perpetrators immediately, saying that it was irrelevant whether or not they had committed a crime. “It may be legal to be a bigot in this country and this world, but you’re not going to be a member of this community and be a bigot,” he said. I don’t understand how someone like Lahey gets to run a university. I just don’t understand it. I can totally understand wanting to respond to the problem in a swift and decisive manner… that’s generally understood to be the hallmarks of leaders. But the problem really lies in the fact that an arrest by police does not generally constitute proof of guilt. What if Lahey has dismissed the wrong student? What if the harassing calls merely came from the guy’s cell phone, and that they were pranks that a “friend” of the accused perpetrated? What happens then? Essentially, Lahey has dismissed one of the university students on the suspicion of an act which might not actually be illegal under the law at all. And the student so dismissed might not have actually made the harassing call. One assumes that there’s sufficient evidence present for the police to make an arrest, but whether that evidence is strong enough to actually indicate real guilt, that’s a question which remains to be sorted out by the calm, cool, and logical process of the court system. In a way that’s been designed to ensure that justice is as dispassionate as possible, to differentiate it from revenge. Well, at least this one suspect’s day in court is tomorrow and we’ll know whether Lahey was correct or not. Still, even if Lahey’s actions turn out to be well-founded, they were made very hastily. Color me old fashioned, but I’d prefer to go to a university founded on fairness and adherence to legal codes, where students would first be “suspended from school pending official investigation”. And given the option of a disciplinary hearing in front of a student-run J-board. I was going to say that you would think a University with a Law School on campus would be a bit better versed on finer points of the law and the due process of justice which protects us all from abuse, but given the track record that Lahey has when it comes to handling Freedom of Press issues when the University has a Journalism school, I guess I shouldn’t be surprised. I’ve worried about presidential elections before, but I’ve never been hopeful at one. Not even when Bill Clinton got elected way back when. I was happy that Clinton was going to win, but never was there such a feeling of collective anticipation of good things to come. Maybe it’s because we weren’t coming off of W Bush and Cheney’s Misadventures in the White House. The absolute worst presidential administration -ever-. EVER. As Chris Rock said in his HBO special KILL THE MESSENGER, “He fucked up so bad that America no longer trusts old white men to run the Oval Office.” And that’s saying something. Today has been difficult. Difficult to concentrate. Difficult to sit still. Difficult to pay attention to anything outside of the election. Facebook has taken off in ways I find absolutely amazing, with political debates and support messages flying back and forth in peoples’ Status messages and comments on the status messages. Conversations happening and people egging folks on to get out the vote, regardless of party. Twitter was pretty cool too, watching some of the special topic groups and the up-to-the-minute “reporting” of everything that’s been going on regarding individual votes and voting. The news coverage aspect of it has been great. I know, for example, that there was one incident where a polling place had to be allegedly shut down due to overzealous McCain supporters shouting and raising ruckus outside of the polls. I also heard of two alleged members of the Black Panthers somehow ‘menacing’ a neighborhood polling place in Philadelphia. Or so the tweets mentioned.CNN and BBC still haven’t picked up on the blurbs, so they might not have happened, or the news moguls are just too busy focusing on the bigger picture. I feel very hopeful about Obama winning. I like the idea of the America that an Obama presidency paints. And for all of the talk about how evil “Socialism” is, I challenge anyone to explain Social Security as anything other than a form of socialism. It’s not like the American economy has been unregulated since the days of Tammany Hall and the original monopolies. What’s wrong with a balance between caring for fellow Americans and ensuring a minimum standard of living, AND having the American Dream for those motivated to climb the ladder to heights of wealth and prosperity? Nothing that I can see. An Obama win doesn’t feel like a “magic bullet” to me. On the contrary, if Obama wins, it will feel like rolling up our sleeves collectively and getting ready to clean up this huge mess we’ve inherited from the blindness and arrogance of the current administration and those who put people like that into power. There is much work to be done, but Obama in office feels like a leader who will see us through it. Change. It feels real now. Or hopefully it will feel real tomorrow. And if McCain wins, I hope that the Obama sticker on my car saves it from the mob.